The hard thing about making a live album is to transfer the energy of a venue and band onto the record. 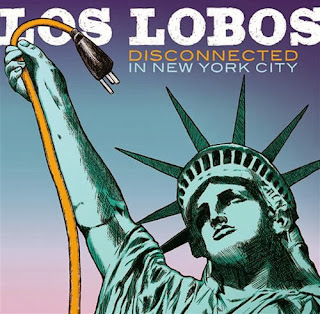 Los Lobos have a strong live reputation and try to catch it on Disconnected In New York City. The band has been around for a grand forty years. With this release they are celebrating that milestone. They have released live albums before in their long and impressive career. Last year a live CD and DVD came out together with the special twentieth anniversary edition of the highly acclaimed Kiko. Maybe that's the reason no songs of that record can be found on this thirteen track album. The deluxe version has four more tracks and a DVD. They clearly chose for the biggest hits of their career. An overview that contains both 'Gotta Let You Know' of their 1984 major label debut How Will The Wolf Survive, and the title track 'Tin Can Trust' of their last album from 2010. All of the songs sound great. The sound is crystal clear and it is as if the band is playing in your living room. There's a nice balance between the band sound and the response of the crowd. Los Lobos are showing what a great musicians they are and what good songs they have written. The nice mix of blues, latin and rock is always tasteful. It is moving between swinging cumbia and sensitive ballads. Because of the "greatest hits" approach many well known songs are passing by of course. But it also made it less exciting. The band give a nice overview of their catalogue but are not really showing what they are capable of. Because of the selection of these songs from two intimate concerts in the City Winery in New York, it somewhat lacks coherence. Therefore it feels more like a collection of snapshots instead of the experience a Los Lobos concert can be. Of course the versions of 'The Neighbourhood', 'Tears Of God' and 'Little Things' are beautiful, but it never really takes off. They are closing with that one big hit we all know. 'La Bamba' is mixed with 'Good Lovin'' into a medley. We all know Los Lobos is so much more than that one smash hit that made them famous around the globe. But you can't really hear that on this album. We will have to go see them in the flesh to hear that. Listen to Disconnected In New York City on Spotify.